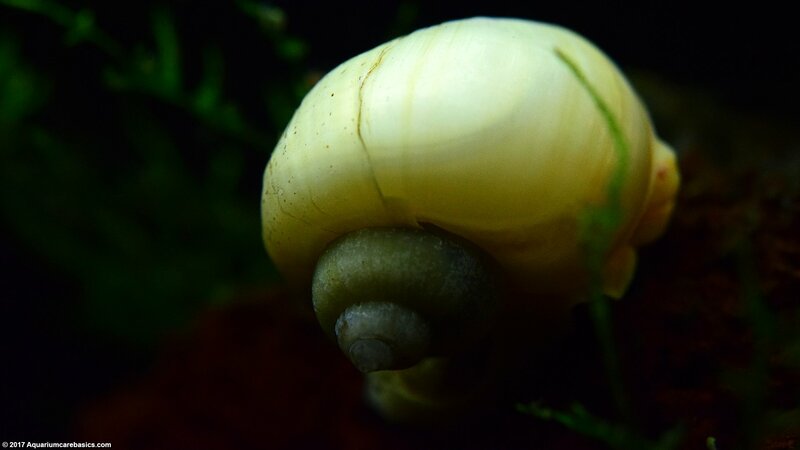 An Ivory Snail is an interesting freshwater aquarium snail to keep. Ivory Snails are becoming more popular, and are often readily available in pet stores these days. An Ivory Snail shell color is off-white, creamy and smooth in texture. Its body and foot color are also off-white, with orange spots accenting the top of its head and mouth. This interesting creamy white and orange color combination can really stand out against lush green plants, black substrate or a black background. What to look for: When buying Ivory Snails look for snails that have healthy, non-cracked, non-pitted off-white color shells. Also make sure the Ivory Snail is moving, or at least stuck on the glass or other hard surfaces. Avoid Ivory Snails if they are laying motionless on the bottom of the tank. Along these lines, look to avoid a snail laying upside down or floating on the surface of the water, as these can be signs that the Ivory Snail is dead or dying. Make sure the Ivory Snail has both eyes and all of its tentacles. Ivory Snails may be kept with store tank mates that take nips at its eyes and tentacles. And as with all aquarium purchases, avoid buying from a tank with dead, dying or diseased inhabitants. An Ivory Snail is calm, peaceful and non-aggressive by nature. It has no means to attack its tank mates and has only its shell and operculum to defend itself from predators. 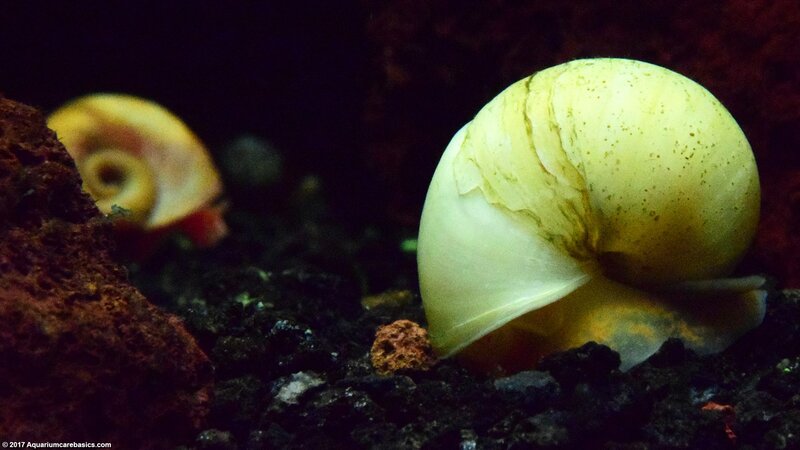 An Ivory Snail can be very active during lighted times, effortlessly moving throughout the tank in search of food or a safe place to rest. 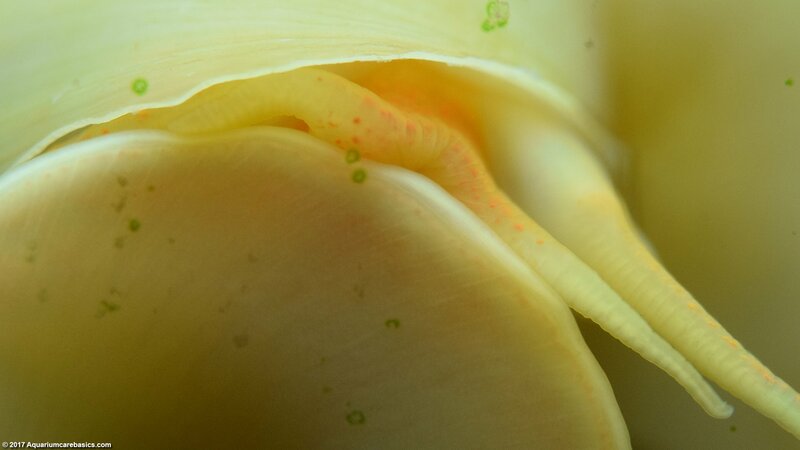 An Ivory Snail can also very active at night. 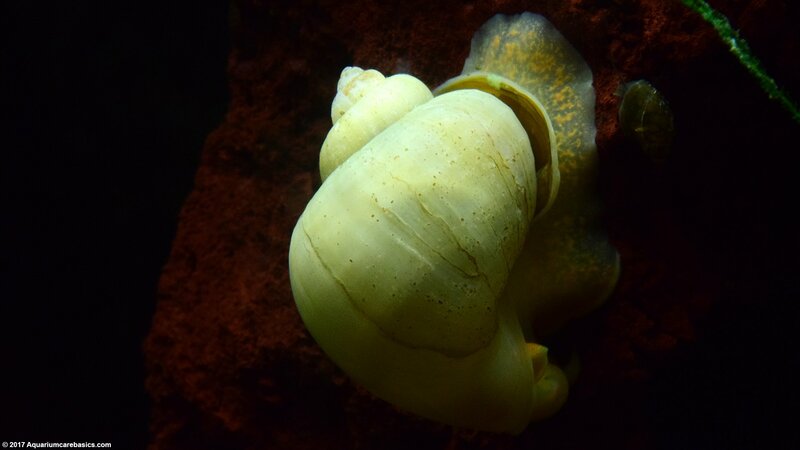 There have been many times when I spotted an Ivory Snail energetically exploring the tank in darkness. 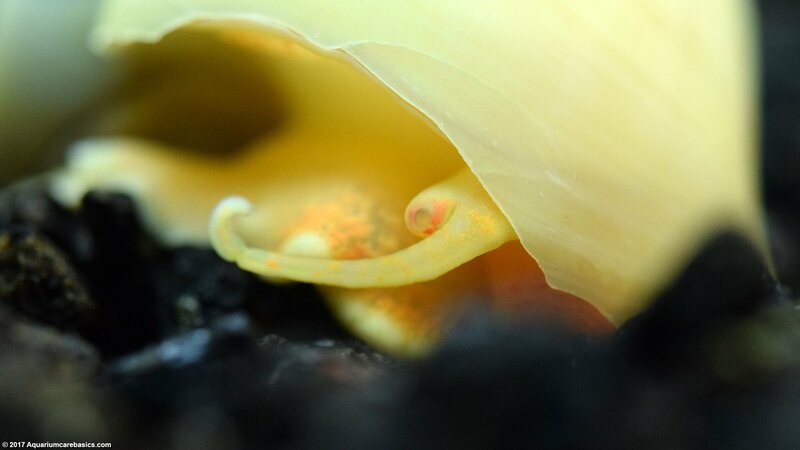 An Ivory Snail’s nighttime behavior is pretty interesting to watch. For as active as Ivory Snails can be, they can be equally inactive. Its not unusual for Ivory Snails to appear dormant and motionless for long stretches of time. 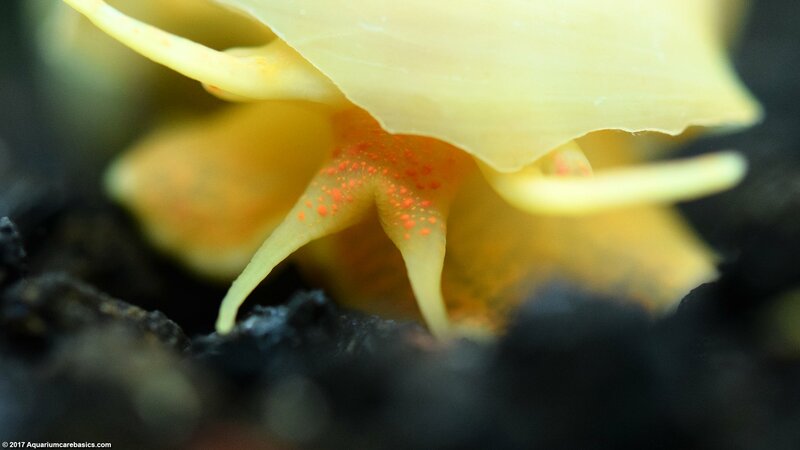 When in inactive mode, an Ivory Snail may like to hide near plants, under rocks, under Marimo Moss Balls, or behind power filter intakes. Its also not uncommon for an Ivory Snail float in water with its operculum closed for periods of time as well. 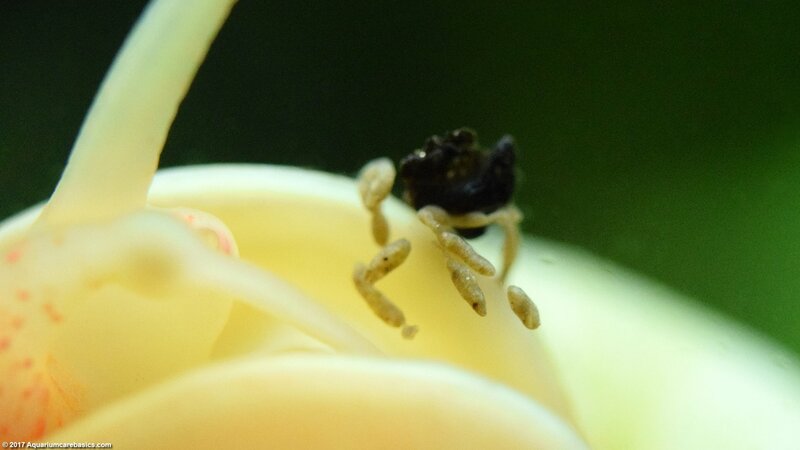 Fortunately, Ivory Snail care is relatively easy. Because Ivory Snail care is straight forward, its good snail for beginners. Ivory Snails can be an escape artist, so keep the tank properly covered to help ensure that the snail will not get out of the aquarium. Ivory Snails that have escaped from the tank can get injured quickly, dry out and die. So be sure to conduct a periodic head count to make sure all snails are present and accounted for. A snail care issue that is sometimes overlooked is how the snail is added to a tank. Gently place the snail in a tank right side up. If Ivory Snails are simply poured from a plastic bag into the tank and lands upside down, it may have trouble righting itself and could die. Healthy Ivory Snails can be about 1 – 2 inches in diameter when purchased from the store, with most being about the size of a quarter around. 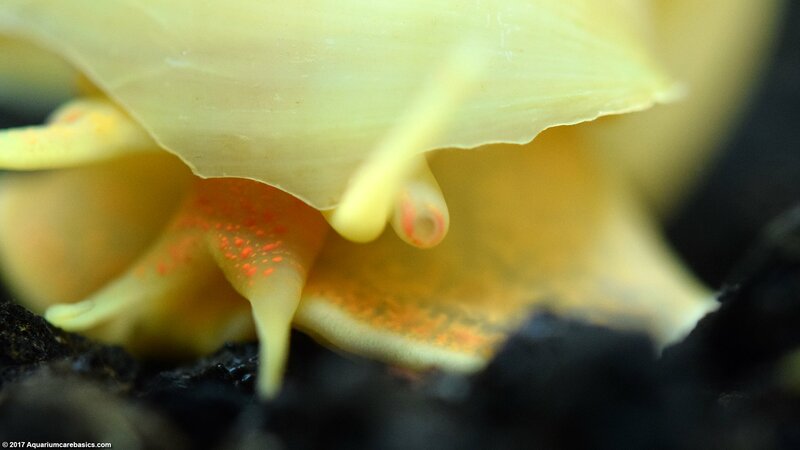 With a the right tank conditions and a little bit of luck, an Ivory Snail can grow a larger over time. Growth will be slow but steady as long as water conditions are right and Calcium rich foods are readily available. 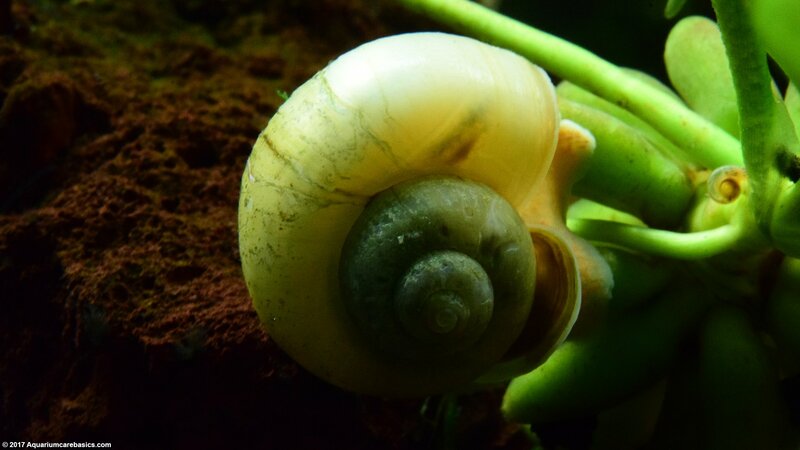 As with other snails, good Ivory Snail care starts with tank size and water conditions. Often, a beginning hobbyist may decide to “add a few snails” thinking that because they are small everything will be alright. Or they may think that because snails are thought of as “aquarium cleaners” they wont really add to the mess. Or they may think that because snails are not fish, they won’t tax the bio-load of the tank. Keep in mind that an Ivory Snail is just like any other tank inhabitant. They feed from their habitat and they produce waste into it. So an Ivory Snail needs to be in tank with sufficient size and water volume to support their life. That said, an Ivory Snail can do well in small established tanks like a 10 gallon tank or in larger established tanks as well. Either way, make sure the rules against overstocking are followed. Keep Ammonia and Nitrite levels at 0 ppm, and make sure Nitrate levels are kept in check with regular partial water changes. Be very careful with tank medications and treatments, and avoid copper as this can be harmful or fatal. 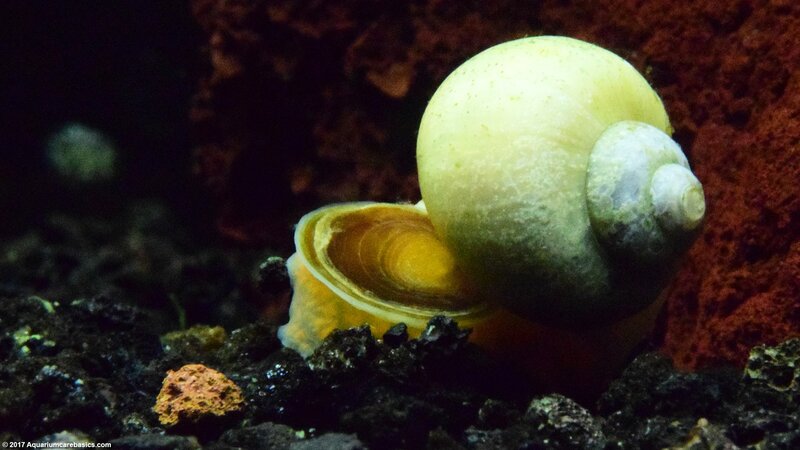 Its important that Ivory Snails are kept in an aquarium water with sufficient Calcium to maintain healthy shell growth. A healthy shell whorl should be smooth in texture from just above the mantle to the apex. A healthy shell will not be thin or excessively cracked or pitted. A thin, cracked or pitted shell can indicate a calcium deficiency, so periodic calcium supplements may be necessary. 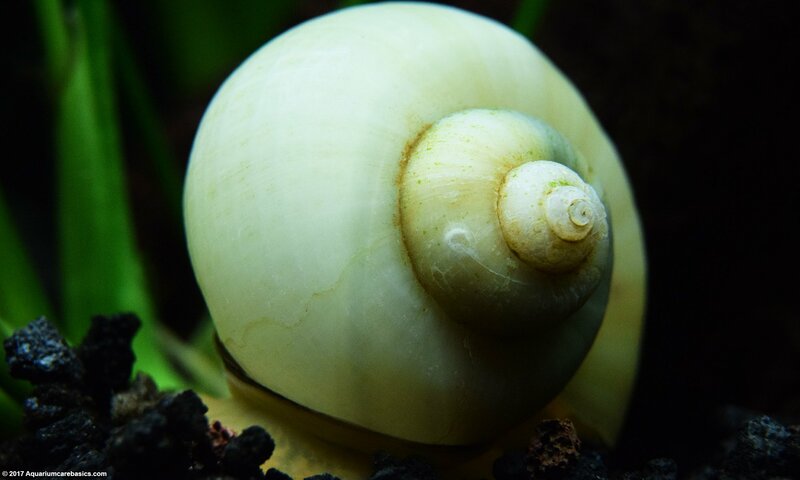 An Ivory Snail can do well in a wide range of aquarium water conditions, but its a good idea to stay within the tropical community fish tank range with clear, moderately moving, oxygen rich water. 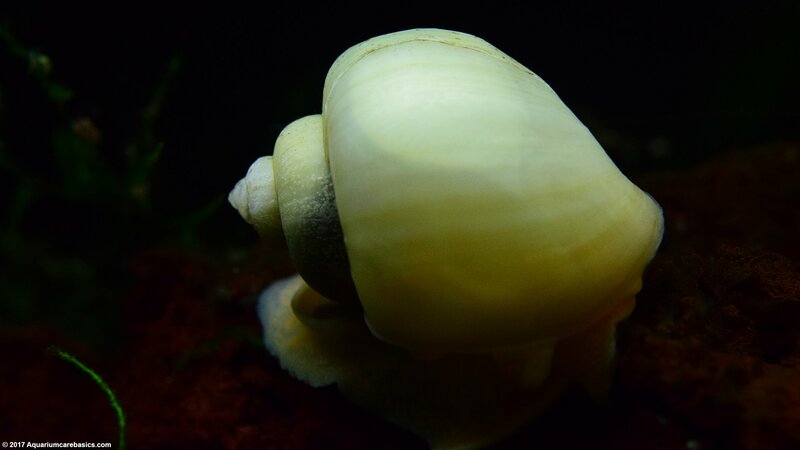 Others suggest that Ivory Snails can do well in less clear, less moving, murky tank water. That may be true, but my personal preference is clear tank water for aesthetic purposes. Aquarium pH: 7.2 – 7.5, with some suggesting lower pH acceptable. Water Temperature: 68 – 82 Degrees Fahrenheit. Hardness & Minerals: On the hard side, with calcium supplements. Lighting: Normal community fish tank lighting. An Ivory Snail is a proficient eater when in feeding mode. Ivory Snails makes good scavengers and tank cleaners, seeking uneaten food and dead plant matter. 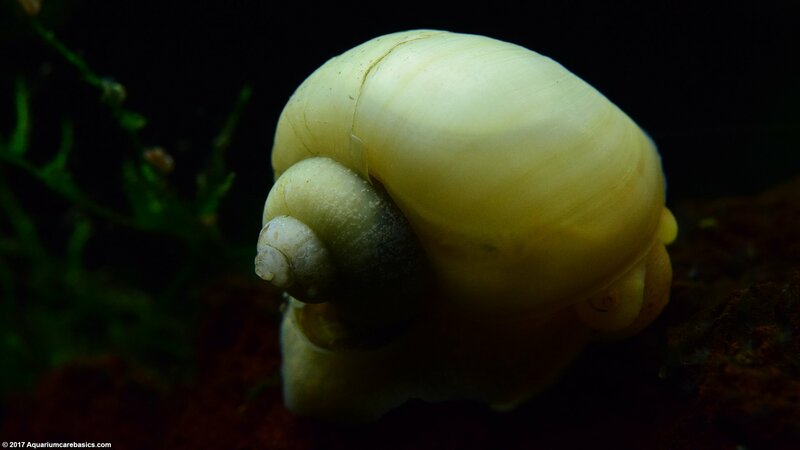 An Ivory Snail also seems to enjoy eating soft algae growing on aquarium glass, decorations, rocks, power filter intakes and other hard surfaces. 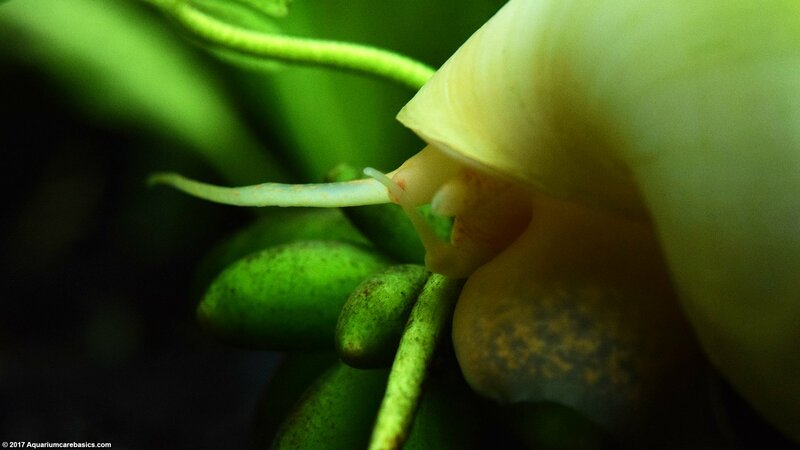 Ivory Snails can also enjoy feeding on edible matter that accumulates on slow growing plant leaves like Anubias Barteri, Amazon Sword, or Banana Plant tubers. Some hobbyists say that Ivory Snails are dangerous to vegetation and are ferocious live plant eaters, but this has not been my experience. 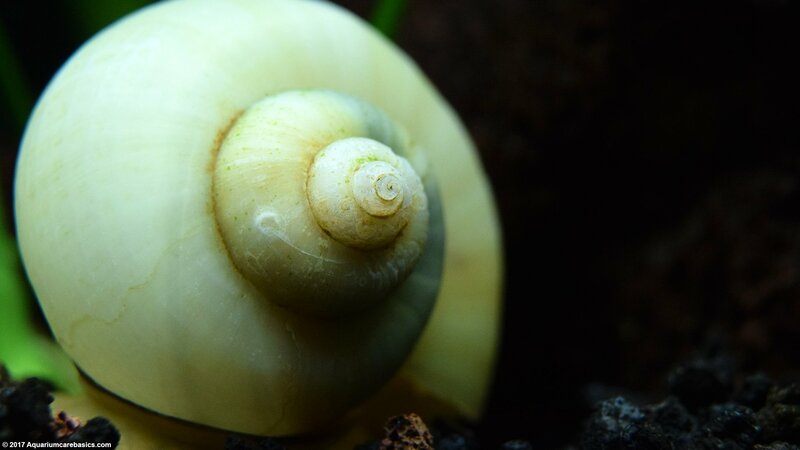 I suspect whether an Ivory Snail devours live aquarium plants has alot to do with the type of plants kept, how well fed the snail is, and the tendencies of the particular snail itself. Nevertheless, the issue is worth a mention. Many Ivory Snails like supplements of fish food, bottom feeder pellets and an algae wafers. Ivory Snails may also like supplements of washed soft blanched vegetables like green zucchini squash or green leaf lettuce. Its fun to try different vegetables to see if the snail is interested. I usually give the snail one day through a lighted and unlighted time cycle. If the snail is not interested in the vegetable after one day I take it out. Its not good to leave uneaten food in the tank too long. Its not good for the water. Given the heads-up regarding live plants being eaten, my Ivory Snails seem to be very happy and healthy in a planted aquarium. I suspect the reason is that an aquarium with live plants is never really “too clean” as there is always a plentiful source of edible vegetation shedding from the live plants themselves. And if my Ivory Snail takes an occasion nip or two at a live aquarium plant, its fine as it can help keep plant growth in check. 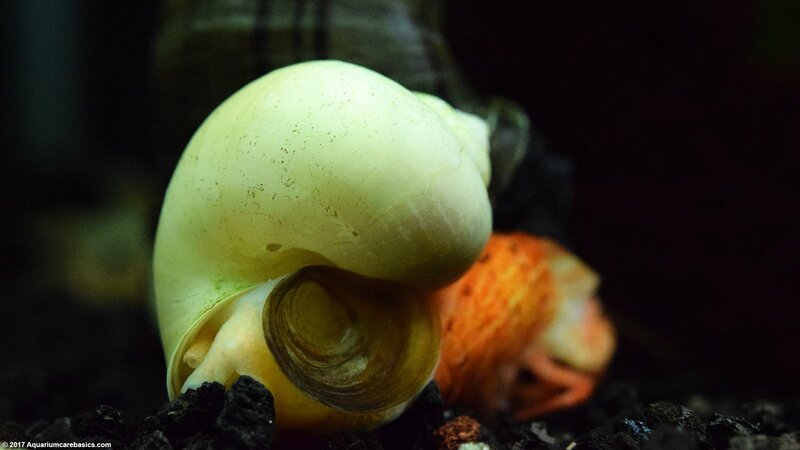 Ivory Snail tank mates can be non-aggressive freshwater community tank fish with shy, peaceful temperaments. 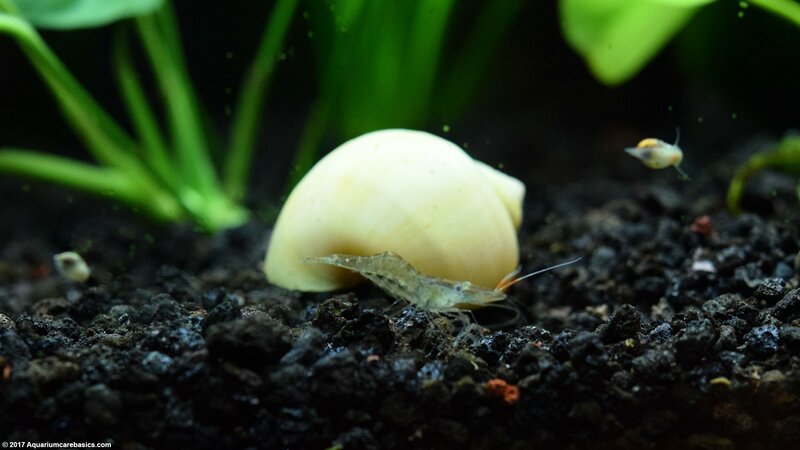 So Ivory Snail tank mates can include: Amano Shrimp, Ghost Shrimp, Red Cherry Shrimp, Otocinclus Catfish and Cory Catfish. Bamboo Shrimp, Vampire Shrimp, Gold Inca Snails, Nerite Snails, Ramshorn Snails, Mystery Snails, Trumpet Snails and others along those lines can work as well. Avoid Goldfish and roughens like Oscars, Jack Dempsey, and other cichlids. They may eat the snail, or nip off tentacles, or eyes and so both. As always, check with the clerk at the store to get his or her input as to whether a species with make good tank mates with an Ivory Snail. An Ivory Snail lifespan is about one year generally, or maybe more if conditions are good and one has some luck. That said, its not uncommon for an Ivory Snail to die shortly after being added to a tank. It may be the stress of being transported from the store, or the shift in water parameters in the new environment. Identifying dead Ivory Snails is not difficult. Observe the snail’s behavior. If the Ivory Snail is laying motionless on the bottom of the tank, is upside down, or floating in the water for longer than usual, remove the snail with a fish net. A dead snail gives off a strong, repugnant rotting odor. When a strong smell is present, the snail is dead and should not be returned to the tank. If the odor is not present, place the snail back in the tank right side up. If the snail remains in that position for longer then one would expect, check again for the strong odor. The snail may be dying. Dead Ivory Snails should be removed from a tank as soon as possible to avoid Ammonia spikes or other water problems.